SAN FRANCISCO & AUSTIN, Texas--(BUSINESS WIRE)--Business Wire, the global leader in press release distribution, and TrendKite, the digital PR platform, today announced the two companies will integrate TrendKite analytics into Business Wire’s NewsTrak reports as part of its Global-Mobile-Social-Measureable (GMSM) suite of services. Public relations, marketing and communications professionals now have an easy way to quantify earned media success with the powerful combination of Business Wire’s news distribution and TrendKite’s media results insights. The integrated service is the first offering to emerge from the recently announced partnership between the two companies. Customers can also see an Article Impact report, which evaluates the quality of coverage by considering readership, social amplification and sentiment of pickups for an overall success metric. Additionally, customers can drill down to see and share individual mentions and pickups directly from the report. NewsTrak Reports will incorporate TrendKite analytics immediately as a new enhancement to GMSM distribution services at no additional cost. For more information, visit www.businesswire.com or www.trendkite.com. Founded in 2012 in Austin, Texas, TrendKite is the Digital PR Platform that puts earned media at the heart of the marketing mix. By harnessing artificial intelligence and big data analytics to optimize the impact public relations has on a brand’s reputation, website traffic and business goals, TrendKite is transforming the way the world views earned media. As a venture backed, high traction startup, TrendKite is disrupting a huge existing market while helping companies like Nike, Google, Delta, SXSW and thousands more turn PR coverage into real business impact. 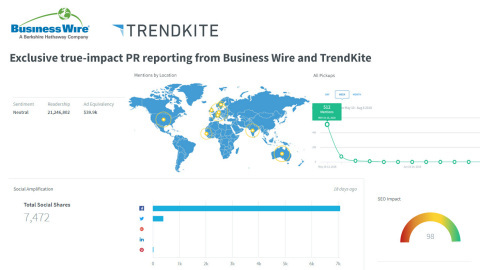 Business Wire and TrendKite Announce the Integration of Business Wire’s NewsTrak Report with TrendKite Analytics.